Venasque is a village in the centre of the Vaucluse department of Provence, to the south-east of Carpentras and east of Pernes-les-Fontaines. 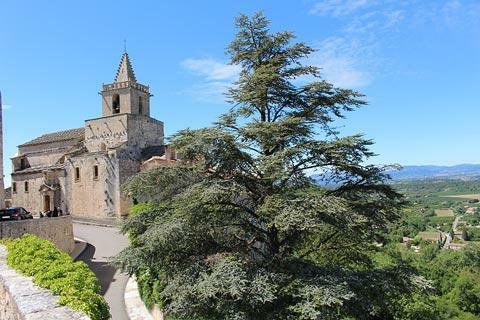 Perched high on a rocky promontory below Mont Ventoux, Venasque has far-reaching views across the Nesque valley and Vaucluse. 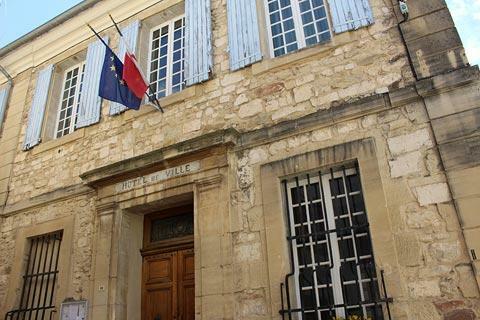 The village is officially listed as one of the 'most beautiful villages in France'. Venasque is quite a small village and does not take long to explore but it has a pleasant centre to explore, with the quiet streets interrupted by the babble from the occasional fountain, and several buildings of particular interest: the most important of these is the baptistery. Starting a visit at the top of the village, you can follow a pretty street of stone houses and quickly reach a small square with a lovely stone fountain and a small cafe. 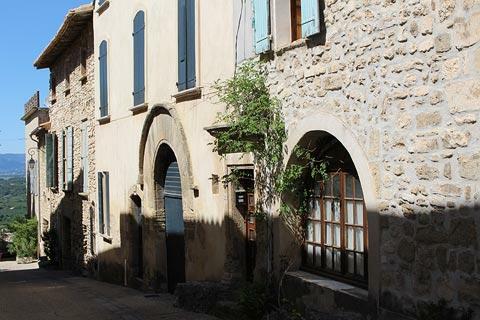 Venasque is largely a one-street village, so to explore just keep following the street! Further along the street you can see a stone belfry and the historic Town Hall. 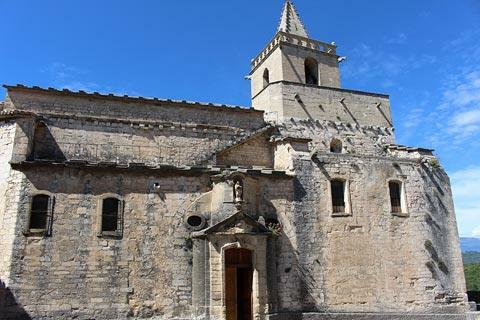 You soon reach one of the main highlights in Venasque, the Church of Notre-Dame, built in the 12th century and transformed in the 17th century. It is a charming church with two stone entrances, one roman style and one baroque style, and a balustrade around the tower. The square in front of the church also has a fountain as well as a belvedere with especially good views - on a clear day you can see as far as the Dentelles de Montmirail. The Venasque Baptistery is an impressive structure dating back to the 6th century and in Place du Presbytère next to the church, although it is almost impossible to see from the outside. The four sides to the baptistery represent the shape of the cross, the five arches in each side represent the senses, and the eight sides to the baptism well represent the seven days of creation plus the day of the resurrection (Easter day). A small entry charge is payable to enter the Venasque baptistery. The traditional 'well' in the middle of the floor of the baptistery enabled adults to immerse their whole bodies in the water during baptism (a tradition that only changed in later centuries when people started being concerned about unbaptised children, and baptism without immersion was approved). The ancient capital stones are also a noteworthy feature of the baptistry. 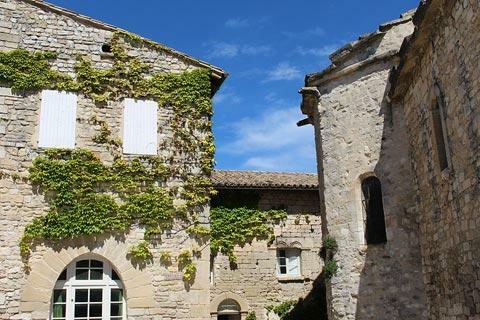 You can also see the Saint-Siffrein Chapel and the Priory of Saint-Pierre-les-Termes as well as parts of the original village ramparts in Venasque. Nearby, one particular highlight in the shadow of Mont Ventoux are the Gorges de la Nesque - these scenic gorges can be seen by road from above the gorge or a footpath through the bottow of the gorges. 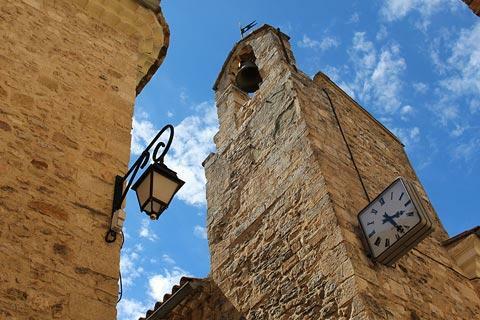 You will also notice many small stone shelters called bories in the area around Venasque, and part of a wall erected in the early 18th century to defend the region against the plague epidemic that was spreading across the country from Marseille. 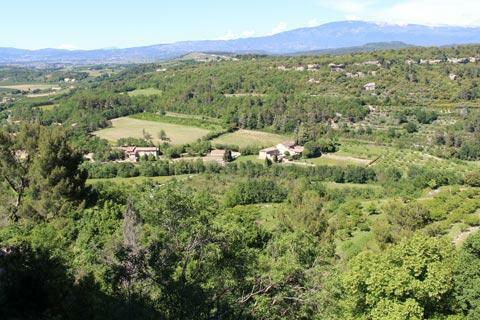 Another small village close to Venasque that we enjoyed visiting is Le Beaucet. 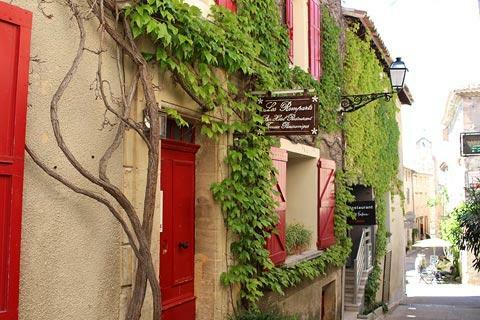 You can find more local travel ideas in the Vaucluse guide and the Provence guide.